Aspiration of a Baker's Cyst involves a needle being inserted into the cyst and the fluid being drained out. Most aspiration procedures don't take any longer than 15 minutes. Before the needle is inserted inside the cyst, you will be given a corticosteriod injection to help with the pain. 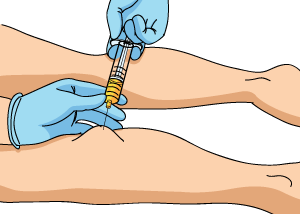 This will either be injected directly into the Baker's Cyst itself or into another area of your knee. During the procedure, a needle will be inserted into the middle of the cyst. The fluid inside the cyst will be drained until it's gone. Your cyst may need to be drained more than once if it's large. After the procedure, a compress bandage will be wrapped around your knee. You may be asked to rest at the hospital for several hours before going home. This will allow the effects of the corticosteroid to wear off. Once you get home following the procedure, rest your knee and elevate it above your heart (pillows work well for elevation). You can remove the compress bandage the next day. The back of your knee will probably appear deflated. If you experience slight pain in the first 24 hours after the procedure, this is normal. Rest and take painkillers to help with the discomfort. Many people who have their Baker's Cyst aspirated find that it comes back. This is because aspiration doesn't address the underlying injury that caused the Baker's Cyst to develop. If you want to get rid of your Baker's Cyst without the heightened risk of it coming back, aspiration is not the best treatment method. 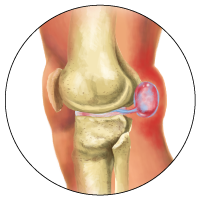 It does get rid of the uncomfortable bulge in the back of your knee, but it doesn't work to heal your underlying injury and doesn't reduce the risk of the cyst coming back.